Cheer your favorite sports team onto victory, make a lasting impression with your customers or potential clients, or award that extra effort with your very own personalized bells. 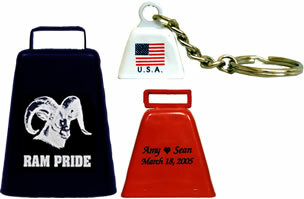 These custom bells are an ideal fundraiser for booster clubs or any type of club or organization, sell cowbell noise makers at events. For businesses, a custom bell with your company's logo creates a great promotional item for your customers or employees. We offer custom bells in several distinct styles. Most styles have multiple sizes to choose from so finding the right size for your needs is easy. Your customized bells may be painted with your choice of color (except the Brass Hand Bell) and if desired a one color logo is added on one side of the bell. 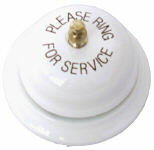 A plastic strap may be added to select Long Distance Bells for ease of ringing. On our Souvenir Cowbell an optional key chain may be added on select bells. On the Ornament Bells a red ribbon loop for hanging is included at no extra charge.